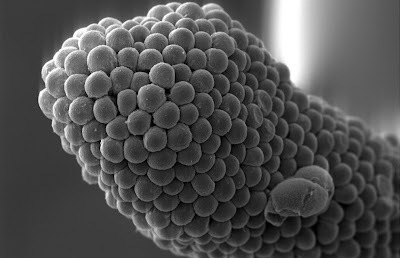 13 Above: Amazing Micro World ! 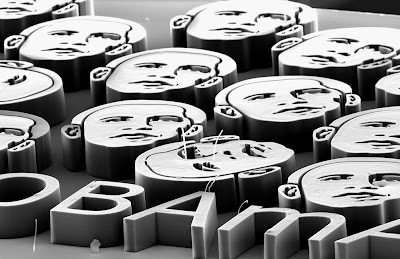 Images of U.S. President-elect Barack Obama, each made with approximately 150 million tiny carbon nanotubes, are photographed using an electron microscope by University of Michigan Mechanical Engineering Department in this image released to Reuters November 10, 2008. The image, based on an original drawing by Shepard Fairey, is just wider than 500 microns and is made of approximately 150 million tiny carbon nanotubes, which is about the number of Americans who voted on November 4, according to John Hart at University of Michigan. Squid Suckers, winner of Honorable Mention in the 2008 International Science and Engineering Visualization Awards. Loligo pealei squids have eight arms and two tentacles, all of which are coated with suction-cups, lined with fangs composed of chitin. These tiny suckers, whose diameters are around 400 microns, ultimately allow the half-meter-long squid to get a solid grip on its environment. 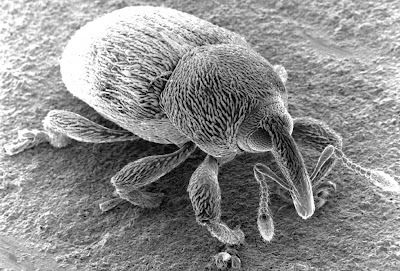 Electron micrograph close-up of a weevil (Curculionidae family) - its snout is just over 100 microns wide. 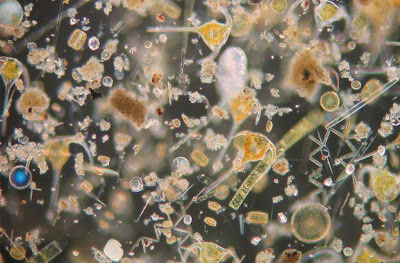 Microalgae seen under the microscope: Carbondioxide-feeders in the ocean. 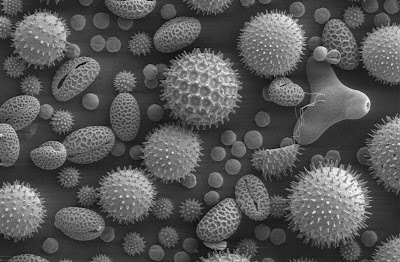 Pollen from a variety of common plants: sunflower, morning glory, hollyhock, lily, primrose and caster bean. The largest one at center is nearly 100 microns wide. 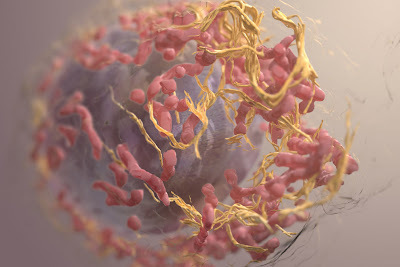 Winner of an Honorable Mention in Illustration in the 2008 International Science and Engineering Visualization Awards, this is a rendered 3D image of a melanoma cell using data obtained using ion abrasion scanning electron microscopy, a novel approach for imaging mammalian cells at nanometer resolution. 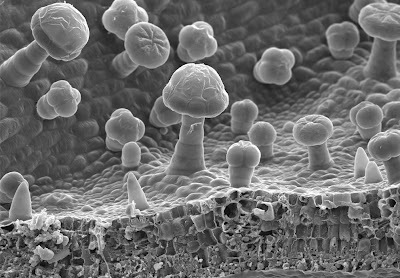 Scanning electron microscope image of Juglans nigra (Black Walnut tree) lower leaf surface, showing a variety of trichomes. 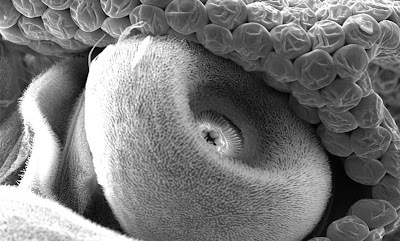 Scanning electron microscope image of the stigma of a Penta lanceolata flower, approximately 140 microns wide. 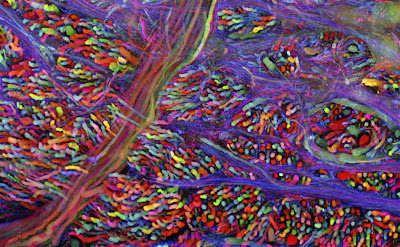 Brain cells of a laboratory mouse are shown glowing with multicolor fluorescent proteins at Harvard University in Cambridge, Mass. The Nobel prize in chemistry was awarded to two Americans and a U.S.-based Japanese scientist for research on a glowing jellyfish protein that revolutionized the ability to study disease and normal development in living organisms. 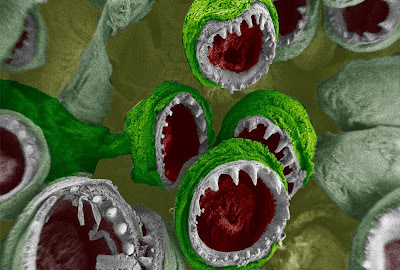 At a magnification of 94X, this is a scanning electron micrograph view of the distal clawed tip of an adult figeater beetle's leg. The insect leg is comprised of a variable number of segments, incliuding the pretarsus, seen here with a claw and spiked empodium. 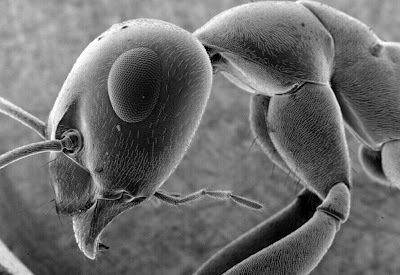 Scanning electron microscope image of an ant. Its eye is approximately 300 microns wide. 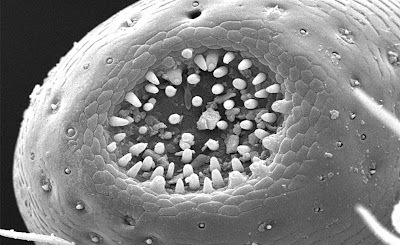 At a magnification of 765X, this scanning electron micrograph reveals morphologic details found at the tip of this adult figeater beetle's maxillary galea, which due to its shape, was given this Latin name for "helmet". The galea is located just medial to another, more prominent maxillary appendage, the palpus. Note the concave configuration at the distal tip of the galea, and how there are numerous pointed protuberances inside this concavity, which are most probably sensorial in nature. 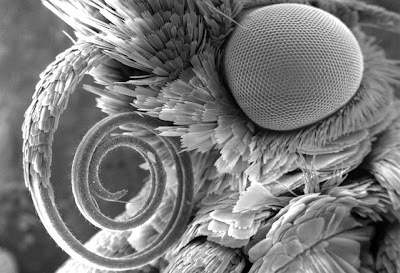 This scanning electron micrograph shows the "scape", or the first segment of an unidentified mosquito's left antenna magnified 500X. Note that the central region of the scape is concave, where the second segment of the antenna, known as the "pedicle" will interlock. The grape-like ommatidia surrounding the scape are the functional units of its compound eyes. This image is of a schistosome parasite. It enters the body through the skin of persons coming in contact with infested waters. The adult worm lives in the veins of its host. 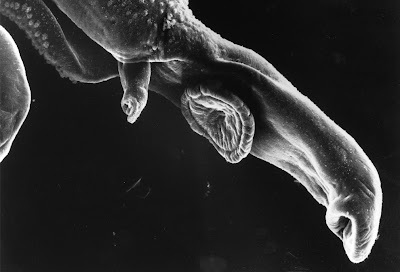 The parasite is magnified x256 in this photograph. 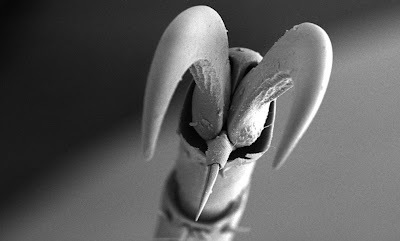 Scanning electron microscope image of a pyralidae moth, a side view of its head and curled proboscis. Its eye is about 800 microns wide. I think they should put the Obama one on a space probe and shoot it to possible ET life planets. Low weight, ideal for space snailmail. The one with the nanosquids just caused to take a lifelong vow of celibacy. The melanoma cell is gorgeous, and looks more like art inside one of those ShakeItUp transparent snow globes than something that can kill you miserably. Juglans nigra is straight out of a mushroom trip I sobbed through in college.